Why You Should Choose This Reverse Apex Timber Workshop. When buying a new wooden workshop or garden storage unit you need to ensure that not only does the building does its job but also that it looks good. The Platinum Fareham reverse Apex scores on both fronts. However it’s important that your new garden workshop is not based on a cheap building, effectively a cheap glorified shed, if you want satisfaction when you work or spend your leisure time in there. A little bit of research will work wonders. Just list down all the qualities of these Platinum garden workshops and then compare with the ‘opposition’. You will be amazed at how good these buildings are – true they may be a little more expensive but you will be getting a serious wooden workshop for your money which will be a pleasure to own. And besides that, the transverse apex aspect of this workshop will provide it with good looks which even the ‘other half’ can be happy with. What’s not to like? Make the decision now and view these wonderful buildings! When looking for a garden workshop for your home you will find these transverse buildings can sit sympathetically in your garden. Being wider across the front gable it gives a feeling of a summerhouse and less of a workshop which can be a bonus when looking down your garden. Besides looking good you will find the attention to details is brilliant. 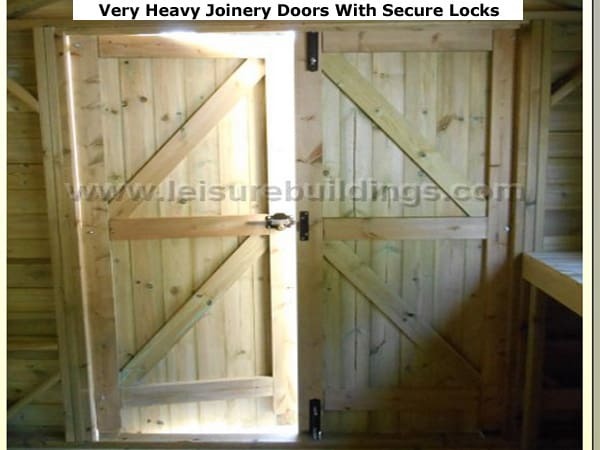 The double doors which come as standard can be compared to a barn door and include, as standard, a ‘Long Throw’ high-security lock to keep your possessions safe. You will also find strong diagonal bracing in the wall, wrap around corner strips and, uniquely, vents in the soffits (underside of the roof) to allow air to circulate in your new building. The choice of redwood deal cladding – from 15mm to 20mm (finish sizes) combined with 19mm (15mm finish) floors and 16mm (12mm finish) roof – which is covered with Onduline Boarding designed to last for 15 years, showcases the commitment to producing the best garden workshop for you. To truly appreciate the strength of these wooden workshops you will need to see them for your self – and you can – at these show rooms and display sites By doing you can be the judge and see the quality for yourself. It’s always a good idea, wherever possible, to view your proposed building before committing yourself and you can at this display site. Which is a pleasant change to the majority of garden workshops suppliers on the web who expect you to buy from a brochure or by looking at a computer screen – NOT ideal. I believe that nothing beats seeing a garden workshop ‘in the flesh’ as this will give you a good idea of the quality of the building, so don’t settle for second best. Take a look on this display site near Guildford and Farnham and see for yourself. So where ever possible view the garden workshop beforehand or, at the very least, deal with a company which does display its products. By doing so this should give you peace of mind. Free Fitting Included with All Transverse Garden Workshops. Assembling a workshop is hard work and that’s a fact. It is also crucial that it’s constructed correctly for long life because if it’s not built correctly you may have problems when the weather is bad. If you build it yourself then this will be your responsibility. All these Platinum Fareham transverse apex buildings will be assembled free of charge for you to save you the worry as well as time and money. As there is NO extra charge for this – then this is a ‘win-win’ for you.? Why wear yourself out or risk not building your new workshop correctly – take advantage of this installation service and put your feet up. Delivery of these Fareham Transverse garden workshops is also included to most of mainland England. Cladding: Normally clad in T&G Shiplap, with standard thickness being 19mm nominal (15mm finished size) which is thicker tham most other. Also available in 20mm Loglap T&G cladding OR 23mm to 6mm Rebated & Lined Weatherboard on these sectional buildings. All timber is Redwood deal not cheap inferior whitewood. Tanalised pressure treated as standard with 15 year minimum expected life against rotting. Screwed together construction. Designs: These Platinum Fareham apex garden workshops are made with an apex or gable roof. Other names for this style of roof is ‘v’ shaped roof, pointed roof, ‘saddle back’, pitched roof or angled roof. If you require a pent roof (single slope) then take a look on this page or a standard apex roof take a look on this page. Height: Internal eaves height is a generous 1.85m (73in) eaves on all sectional buildings. Normal ridge height is at least 2.28m (89 inches) which is less than 2.5m if you have planning issues. Please check before ordering if heights are crucial in connection with planning. Installation: All our Transverse apex garden workshops are fitted FREE of charge. All you need to do is to provide a solid level concrete or paving slab base or timber decked area, or maybe it could be built on your timber bearers. There is also an option for building a timber raft for you. Buildings are assembled using screws for ease of taking them down again if you decide to move. Viewing: Option to view these superb garden buildings before buying so you can inspect at first hand the high quality of the materials used and the construction methods. Show sites near Farnham and Guildford in Surrey. Please check which models are on site before visiting to avoid disappointment. Support UK: These Platinum Fareham apex Heavy Duty Garden Workshops are made in the UK by experienced craftsmen. Back our British workers. Sizes: Unless specified as finished size then workshop sizes quoted are before machining which reduces the size quoted by about 3mm. BEWARE. Many garden workshops manufacturers quote BEFORE machining sizes making them APPEAR larger – don’t be fooled.